Omotesando’s more down-to-earth neighbor and Harajuku’s more sophisticated older sister; Aoyama is a place to refresh, get inspired and feel fancy. So it only makes sense that our staff decided to make it our go-to destination for a girls night out – Tulip style! There is a certain air to Aoyama that gives it an exclusive feel, perhaps because it is tucked away in the hilly slopes of Tokyo, but the small streets do not feel too narrow. Or maybe it’s the effortlessly fashionable artists and designers that can be overheard talking about their up and coming projects in passing. The tiny, boutique shops and local bars’ dedication to their craft to produce top-notch quality and protect the artisan culture, or maybe it is the eclectic architecture that somehow the groups of tourists have not yet discovered. Heading over to dinner, we passed by Sunny Hills, designed by one of Tokyo’s most beloved modern architects, Kengo Kuma. Fans of Kuma’s work should definitely check out his many projects scattered around Kagurazaka, where we also happen to have two lovely share houses, Chilli Pepper & Cream and Happy House Kagurazaka. As we approached the restaurant, we were taken aback at the gorgeous exterior and atmosphere. Walking through the bar area (and slightly regretting our outfit choices), we were shown to a table seated by a lit-up terrace. Cicada is located just a minute’s walk from Omotesando Station and specializes in modern Mediterranean cuisine. The space itself has a Euro-chic atmosphere but the flavor of the dishes were deliciously authentic. We started with some toasted pita accompanied by various dips of your choice – we went with the classic hummus and a carrot, yogurt, & mint spread. The cocktail menu was very impressive, which is expected as the restaurant is owned by Tysons & Company, the founders of T.Y. Harbor Brewery. After our lots of chatting, laughs and “kanpais!” we scoped around the area for a place to grab some cocktails. We stumbled upon Radio Bar and were intrigued by its retro atmosphere, like something out of an old Japanese movie. It turned out that Radio Bar has been around since the 1970s, and THE place to go for cocktail connoisseurs and aspiring mixologists to enjoy a proper pour (which is hard to come across in Tokyo nowadays amongst all the Lemon Sours and Whiskey High Balls). Accompanied with an incredibly delicious spread of fresh fruits and cheese came Bar Radio’s original cocktails served with impeccable presentation. Each cocktail has been meticulously crafted and perfected over the decades and we appreciated the attention to detail until the last very last drop. Because of the high standards of the establishment, the cocktails are not at all cheap and be prepared to be on your best behavior, that also means to dress accordingly! Satisfied and slightly emotional over how exquisite our night has been so far, we were not ready for it to end. We decided to check out the nearby Commune 2nd, suggested by our staff Jan who is in the know about many Tokyo’s hidden gems. At Commune 2nd, you will be greeted with hip, neon clad signs, beer and food stands with a modern-style food truck-like layout, and groups of merry making locals and foreigners alike enjoying themselves over drinks and food. Commune 2nd closes at 10 PM, let’s clarify that all the shops and eating spaces close at 10 PM sharp! We had too much fun in the lively atmosphere and did not want to leave, but had to take a team pic while we were getting kicked out. Thanks for reading and enjoy Tokyo to the fullest! Tulip Real Estate specializes in female-only share houses in Tokyo. Send us a message to ask about our share houses and we are more than happy to recommended our favorite places to check out nearby. Summer is the season of festivals in Japan, every year thousands of Japanese people and foreigners alike gather around to have a culturally-rich experience with dancing, fireworks and tasty treats! Local temples and shrines usually hold at least one festival, which is their opportunity to spread blessings and good fortunes to their towns and the people who live in them. When you live in a share house in Tokyo it can be a great opportunity to experience these events for the first time with your housemates. 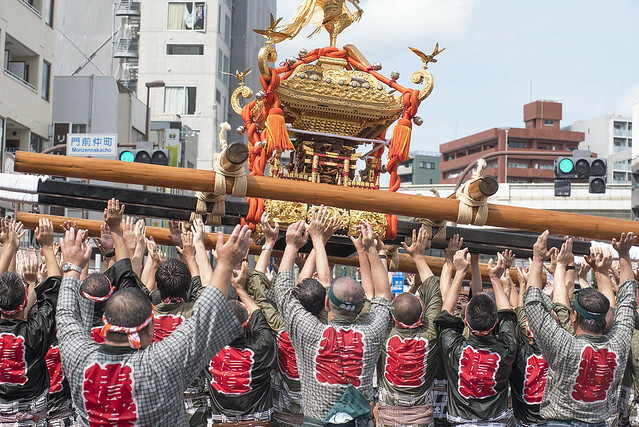 Considering this festival is one of the biggest Shinto festivals of the year, it can be one of the most memorable experiences you can have in Tokyo in August. Being described as fun and energetic, it`s a festival that cannot be missed. 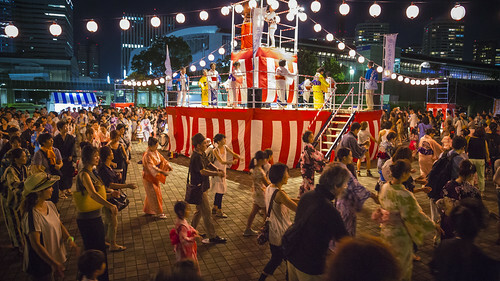 In the gorgeous area of Minato-Mirai, there is a dance festival led by hundreds of women in yukata (a summer-time kimono). Foreigners and Japanese people are encouraged to join in and even come to the event dressed in yukata too! If you are a resident at Witt-Style Roppongi, there is a perfect opportunity to attend this dance festival. If you are not the type to enjoy dancing with the locals, we recommend you sit-back, relax and enjoy watching the kimono-clad festivities with some tasty festival food such as yakitori, which is a type of chicken on a stick, takoyaki which is octopus dough balls or the classic ice-shavings Summer treat, Kakigori. If you want to attend a festival but find it hard to cope with the scorching Summer heat, one of the best options is the evening-held matsuri event – Koenji Awa Odori. Especially a great spot if you are a resident of one of our newest share houses; Happy House Koenji. Finally, if watching fireworks is on your Summer Bucket-List make sure that the 44th Annual Kanazawa Fireworks Display gets a spot on your list. If you are willing to travel a little further for a spectacular evening with an incredible beachy-style atmosphere under a sky of fireworks, this festival will be perfect for you. As it is one of the last Summer Firework Festivals in Japan it can get busier than most, but if wearing yukata and enjoying Yokohama`s sights and attractions under a night-sky of fireworks sounds good to you, this event is definitely for you. Let us know what Japanese festival is your favourite in the comments and be sure to check out our website for our huge and varied selection of female-only sharehouses in Tokyo! Summer is approaching its peak and we all know what that means…its traveling season! If you live in Japan, you might have noticed that Taiwan has been a trendy go-to destination for Japanese people for quite some time. People of all ages flock to Taiwan for vacation for many reasons whether it be because it’s just a quick flight away, for the bustling night markets, instagrammable foods (mango shaved ice, boba, and dumplings, oh my! ), traditional temples, or Studio Ghibli lovers yearning to walk through the small town that was used as an inspiration for Hayao Miyazaki’s “Spirited Away” – Taiwan is a place for one and all to enjoy. We decided to head out to Taiwan to catch up on the excitement for ourselves! If you are planning on taking a Taiwan trip soon, here is your guide to delicious local eats and must-see spots. First up is Huashan 1914 Creative Park located in Taipei’s center. Originally a winery, Huashan 1914 Creative Park has been transformed into a spacious park and marketplace with an artsy twist that is free and open to the public. Here you will find galleries, rotating exhibitions, design shops, trendy cafes, and even an independent movie theater. The space has a mysterious and historic feel as most of the buildings are covered in plants or have been left untouched with the faded exterior. The structures throughout the space have an industrial feeling and house high-end, hip fashion shops and local artists alike. Taipei is a bustling city with crowds, restaurants and street markets, but there are also many pockets within the city where you can enjoy parks, temples, and traditional constructs like Chiang Kai-shek Memorial Hall. Taiwan’s ministry of culture transformed the hall to become a national landmark for “facing history, recognizing agony, and respecting human rights.” In the large park and plaza surrounding the monuments, you can find groups of people meditating, practicing Tai Chi or dancing in various styles in the early mornings. If you have time for a day-trip while in Taiwan, try going down South to Kaohsiung City where you can see the Tiger and Dragon Pagodas. Enter through the mouth of the beasts and climb up the spiraling staircases in the seven-story towers. Also a famous attraction in Kaohsiung is 85 Sky Tower, the tallest building in the city where you can check out the observation deck on the 74th floor that overlooks a stunning view of Kaohsiung and its main harbor. The elevator ride to the observation deck goes dark and projects a star-light show on the ceiling! Hop on a ferry and in 5 minutes to Cijin Island where you can stock up on fresh fruit and seafood at the street market leading up the beach and enjoy the local island feeling. I have had my share of mango shaved ice in Taiwan but the Cijin Island shaved ice was hands down the best! Next up is probably #1 on a lot of our Taiwan bucket lists is Jiufen – a small village tucked away in the mountains that is now one of the top attractions in the world for anime lovers. Known to be used as the model for the ghostly street market in Hayao Miyazaki’s “Spirited Away,” you can explore the shops serving delicious street food, local handmade goods, and of course some Ghibli souvenirs to take home. Kao Chi – A dumpling house right next door to the original Din Tai Fung dumpling house that started it all. Despite being near the now world renown dumpling house chain, Kao Chi stands their ground offering delicious freshly steamed dumplings and packaged to-go bites for the road. The crab and miso dumplings are a must! Eastern Ice Store – Located in the hip and international area of Daan, Taipei serves cold or hot dessert bowls with your choice of rice cakes, red beans, grass jelly, etc inside. A perfect dessert for any season. Wang Ji Fu Cheng Rou Zong – With less than 10 items on the menu, this local shop is sure to give you a true taste of Taiwan. Try their signature pork rice dumplings, noodle dish, and fish ball soup. Tiger Sugar – A shop you won’t miss because of the enormous line, this boba shop has taken the popular milk tea tapioca drink and uses their own brown sugar concoction to take it to another level of milky heaven. Totally worth the wait! Resident Interview: Witt-style Roppongi in Roppongi and Azabu area. We visited Alex at Witt – style Roppongi shortly before Christmas and then took a short walk with her before we stopped at Starbucks for a chat. Alex has been living in Japan for 7 years, and is now working near Tokyo Tower. For 3 months, she had been walking pass the house that would become Wit t – style Roppongi everyday. When we turned the building into a share house in June 2017, she became one of our first residents. Tulip: Hi Alex, what interested you in our share house, and how was your experiences with shared houses before Witt – style Roppongi? Alex: I lived almost door-to-door an hour away from where I work. And though I loved where I used to be, I was looking for a place closer to work because I did not like riding the train during rush hour. While I was looking for an apartment on Craigslist I came across an ad for this share house. I emailed your company, viewed the house and then moved in by the end of that month. As I’ve lived in shared apartments in Japan in the past I was looking forward to moving and being closer to work and friends. Tulip: What is your favourite thing about living in Witt – style Roppongi? Alex: I’m most happy about the convenience of living here. It’s really close to my work so I don’t need to take the rush – hour trains. And I hang out with my friends around here too because they all live near the area. About the house itself, I wish there were more common space s that would allow more socializing, like a proper living room. But I like the set up of the kitchen, with the common dining table and TV. It’s good for the size of the house. Tulip: How would you describe the surrounding area you live in? Do you have any favorite spots? Alex: The surrounding area is surprisingly quiet though it’s just right off the main Roppongi Crossing. You only hear people walk up and down Roppongi and the Izumi Garden area. It’s such a nice area and again, it’s so convenient if you want to go shopping or go out for food. I eat out a lot so I can name a few favorite places. Down the street, there’s this place called Downtown B’s Indian Kitchen. Right across from there, in Izumi Garden, there is a Thai restaurant and a salad restaurant I enjoy going to. Right next to the share house is another Thai restaurant. If you go further down to Roppongi Hills there is a soup dumpling place that’s really good [Nansho Mantoten] and a French place called Brassaerie Va-tout. They serve really good lasagna. Everything is just within a fifteen-minutes’ walk from the share house, including my favorite sushi bar, Uramakiya. Tulip: Thanks so much for the recommendations! Do you have other favorite things to do in Tokyo? Alex: I run, so I really like to go running around the Imperial Palace and seeing what’s around there. That’s my favorite place to run in Tokyo. Tulip: Do you discover new places while you run? Alex: I don’t technically go and explore. I figure out where things are while I run. For example, I didn’t realize how close we are to Hibiya Park. One day while I was lost I ran by Hibiya park and it was a nice discovery. I like exploring, but I especially like going outside of Tokyo. I don’t like being around a lot of crowds so I tend not to go to places that are crowded on the weekends, like Yoyogi Park, Harajuku or Shibuya. I try to leave Tokyo on the weekends. Whenever I can, I go snowboarding or go visit friends where I used to live in the West Coast of Japan. One of my favorite hiking spots around Tokyo is Mount Takao, and I really enjoy going on trips with the Tokyo Snow Club. I go snowboarding with them in winter and on fun trips in the summer. Alex: I’m used t o sharing space. Every year from when I was nine, I used to go to sleep – away camps and at one time we had 21 girls in one cabin. At a sleep – away camp you learn to share your space. In college , I was living with roommates too. I had my own room but we sha red a common space just like in the share house. Tulip: How would you compare your living experience in Japan, between living in a share house and living in your own apartment? Alex: I miss having my own apartment where I can decorate and call everything my own. I had my own apartment when I was living in Toyama. But at the same time, I work all day and I go and see friends, so it’s also enough just to have my own room to come ho me to. It’s a nice space and we rarely get in anybody’s way in the share house. Tulip: Have you had any challenges in the house? And what did you do to overcome or resolve those problems? Alex: I sometimes have to remind people to remove their hair from the bathtub, but there aren’t so many challenges. I think we’re doing okay in this share house. There’re bound to be issues that come up when eleven people live in the same house, but when something comes up , you can contact the management to help you communicate with your housemates in a polite and understanding way. Tulip: Do you hang out with your housemates sometimes? Alex: Occasionally . Most everyone in the house ha s different schedules. Mostly we just hang out in the kitchen if we see each other . Tulip: Do you have any other plan in the future while you are in Tokyo? Alex: For now, I’m really enjoying my work and I don’t plan to leave Tokyo anytime soon. I have some personal 2018 goals such as running a half marathon and doing the 2018 Spartan Races . But for my living situation and my professional situation, they aren’t going to change anytime soon. Tulip: Is there anything else you would like to share with our readers about your experience in your share house? Alex: I’ve had a good experience in the house so far. I’m really happy with my living situation . The funny thing about this house is that I passed it every day for about three months on my way to my friend’s place to train for the Spartan Race. I remember that 2 or 3 weeks before I found your advertisement, I was jokingly wondering if one of the houses in the area ha d a room for rent. I really wanted to move closer to the area and when I came to the house for a viewing, I was like, I know this house! And now I’m here . Overall, I think it has been a good experience and I am glad I was able to move here. Tulip: Thank you so much, Alex. We’re glad to hear that you’re enjoying your time in Japan and in Witt-style Roppongi. We wish you a lovely holiday! 14 Picnic-Perfect Hanami Spots Near Tulip Sharehouses! Spring is now upon us and cherry blossoms are in bloom! The Tulip Team have put our heads together to present you with the best sakura viewing spots next to each and every of our share houses. Below is a list of 14 parks and places with which you wonderful ladies and gents can refer to next time you’re in town for the traditional Japanese cherry blossom viewing custom also known as hanami (花見). From lively, popular viewing spots such as Yoyogi Park in Shibuya, to serene hidden gems in the likes of Araiyakushi Park in Nakano, we’re sure you’ll find one that suits your fancy to admire the fleeting yet sensational wonder that is Japan’s sakura! A brisk 12-min walk from Happy House Asian and an 18-min walk from Happy House Orange is Nakano Central Park, a dog-friendly open space lined with sakura trees, plenty of eateries (think cafes and shops), convenience stores, and, depending on the time of visit, an impressive, ever-changing collection of food trucks. Nakano Central Park is also the venue of the Cozy Culture Club’s debut hanami picnic event! Bring your own bento and join us for a FREE afternoon of language and culture exchange fun. We’ll be also grabbing freshly brewed Kirin beer at the foodtrucks nearby, so be sure to bring some change. Interested? Sign up on Facebook or Meetup, we’d love to see you there! For a quiet, pleasant hanami party, take a 3-min stroll down from our Happy House Vitamin Color, Araiyakushi Park is home to 24 beautiful cherry blossom trees. The park is teeming with greenery and features a relaxing Japanese-style koi pond swimming with goldfish and carp, the Arai Yakushi Otera Temple, and a brilliant spectacle of cherry blossom illuminations during hanami season. Walk 2-min from Cozy Village Jasmine or hop on the 中41 bus heading towards Nakano Station from Happy House Herb for a 10-min ride to a beautiful part forest and part park scenery of ponds, river, and tall trees. Testsugakudo Park, while small-scale compared to the likes of Shinjuku Gyoen and Yoyogi, the park’s 77 philosophy-inspired buildings, stonework, and pathways make for a lovely, serene afternoon stroll. Cherry blossom trees line the riverside leading to a cherry blossom circle perfect for hanami picnics. PS. Happy House Vitamin Color residents, you’re in luck with options, the park is an 18-min walk from the sharehouse! While Yoyogi Park isn’t the most picturesque of parks in terms of landscape design, its wide open space ensures you won’t be fighting for inches of grass on which to layout your picnic blanket. Plus it ensures you a view of the cherry blossoms no matter where you’re seated! Psst, Witt-style Yoyogi and Witt-style Jingu residents, the park is a mere 5-10min walk from the sharehouse – leaving you ladies with no excuse NOT to go out on a hanami excursion. Despite mainly catering to horse-riding children (yes, there are actual horses meandering on site! ), Setagaya Park is home to several beautiful gardens, lovely grassy knolls, a center piece water fountain, and, of course, plenty of cherry blossom trees for hanami. If you are lucky, you might even stumble on an occassional flea market. Psst, this gem of a park is lcoated only a mere 10-min walk from our Witt-style Mishuku sharehouse! Slightly off the beaten path is the quiet, lush greenery of Wadabori Park, a natural enclave from the city’s hustle and bustle. Happy House Kamikitazawa residents, take a perfectly doable 15-20min breezy afternoon bike ride from the share house and lose yourself in the leafy shades, and unwind with a stress-free spring stroll down the path lined with cherry blossom trees along the Zenpukuji River. Best of all, the park features 10 BBQ facilities (reservation with the Suginami Ward Office required) and the athletic fields are free for all on the 1st Sunday and 3rd Saturday of the month! 10-min by foot from our Witt-style CloveR is Toshimaen. A lively amuseument and water park throughout the year, the charming old-fashioned park is magically lit up after dark during sakura season. The park’s special “Sakura Nights” entry program provides unlimited access to designated rides and attractions while admiring the illluminations on over 500 cherry blossom trees! For more sakura illuminations, head over to the exquisite Japanese-style Rikugien Gardens at Sugamo Station near our Witt-style Apricot Terrace. After sunset, the gorgeous Waka poetry-themed park is transformed into a brilliant fairlyland of dazzling cherry blossom illuminations that are well-worth the entrance fee. PS. Word of advise, book online and get there early to make it in ahead of the line of lovebirds! Oh, and don’t forget to bring your camera! Formed in the Edo era, the Kanda River runs from Inkoashira Park in Mitaka Ward, joining the Sumida River underneath the Ryogoku Bridge. Numerous cherry blossom trees bloom along the riverside, however, one of the best spots to view it is at this particular point inside Edogawa Park, titled 神田川桜並木 on Google Maps, which is a 9-min walk from Happy House Kagurazaka and a 18-min walk from Happy House Stella. The river itself is only a 10-min walk from Happy House Stella, and nearby parks include as Kansen-en Park, Higo-Hosokawa Garden, and the Chinzanso Garden. For yet another river-side hanami picnic option, why not check out Sotobori Park, with a promenade that connects Ichigaya and Iidabashi Station. Chilli Pepper and Cream residents! Make a 5-min walk down to the park to enjoy a relaxing morning or afternoon stroll (whichever suits your fancy!) underneath a canopy of white cherry blossom petals while listening to soft river sounds! Constantly featuring in Tokyo’s top 10 hanami viewing lists, Meguro River Park is THE place to go for a feel of the much-talked about cherry blossom rain and all-around hanami atmosphere. Numerous small, delectable eateries lining both riversides present the perfect opportunity for a quick bite (or two!). We highly recommend getting there around dusk, grabbing something nice to drink (ala our staff did in the pic above! ), and enjoying the changing view from light to night. Our Witt-style Nakameguro residents are in luck, the hanami hot spot is just a 17-min bus trip or a 15-min bike ride from the house! The hanami scene at Roka Koshun-en Park is hands down the most floral site on our list, with a fusion of colors from both pink sakura and yellow rapeseed blossoms! Former residence of famed writer and philosopher Roka Tokutomi, actual name Kenjiro Tokutomi, the historic park grounds contain the author’s prior place of abode, a garden and bamboo forest, a shrine, and an abundance of forest-like flora. OKURA HOUSE ladies, we promise you it’s absolutely worth the 15-min bike ride! Take a break from Roppongi and enjoy the cherry blossoms with a view of the city’s signature Tokyo Tower at Shiba Park. While not the most aesthetic of parks, its spacious grass fields is excellent for a spot of afternoon napping or for unrolling a substantial picnic spread. The park is also adjacent to the impressive Zojoji Temple, making it a perfect blend of modern, history, and nature sights – all this just a 15 to 20-min walk from our Witt-style Roppongi! Measuring 260,000 square meters, Johoku Central Park is one of the city’s largest with plenty of green, open space for spreading out picnic baskets and blankets. With its vast grassy fields, a huge athletic field, and plenty of tall trees, our Happy House mint residents only need make a 11-min walk to reach the perfect spot to do a bit of jogging or an early morning outdoor yoga session! PS. The park also has a special area designated for housing Moro relics dating back to the stone ages to satisfy your inner history buff. So you’ve been up and down the Skytree, shopped your heart out in Shinjuku, have an album of photos from the Shinjuku Gyoen in all four seasons, and are itching to discover a different side of Japan… buttttt hard-pressed for time. May we suggest a day-trip to the neighboring Kanagawa Prefecture with its gorgeous coastlines and unique slice of history? If so, read on for the low down to an easy-breezy inexpensive day trip to to the beautiful island town of Enoshima and the historic temple city of Kamakura! First things first, transport. We highly recommend purchasing the Odakyu Line Enoshima-Kamakura Free Pass. The one-day pass includes one round trip from your departure station to Fuijisawa, unlimited hop-on and offs on the Enoden Line between Fujisawa all the way to Kamakura, and discounts to a few attractions. The pass is available at the Odakyu Sightseeing Service Center in Shinjuku or at any Odakyu Line station ticket machines. See here for a guide on how to buy from the ticket machines. Hop off at Katase-Enoshima Station and make your way over to the Katase Nishihama Beach for some of the closest beaches to Tokyo and an amazing, unobstructed view of Mount Fuji! Popular with surfers, the beach is also the scene of a number of parties in the warm summer months. From there, take a 20min walk across the ocean via the connecting bridge to Enoshima Island. Sitting on Enoshima Island is the Enoshima Jinja, one of the nation’s Three Great Shrines dedicated to the Benzaiten (弁才天) goddess of art and fortune. Legend has it that this particular Benten shared a love story with a five-headed dragon, hence the many dragons decked out on the grounds. The Enoshima Jinja is also home to three goddess and their respective shrines – Hetsunomiya, Nakatsunomiya, and Okutsunomiya (from lowest to highest). Psst! Tulip Tip: the stairs aren’t as daunting as they seem! Stretch your legs and save some cash by skipping the escalator and hiking up to the top. It’s a charming 15-20 min walk from the bottom shrine with lovely views of the island town and its coasts. Taking the trip with your significant other? Follow the signs off the main path and make your way over to the Lovers’ Bell. Ring the bell, make a wish, and attach your lock onto the fence with the many others to enjoy eternal love. Purchase a lock at the shops on the way to the entrance, or opt to bring your own! Singles, feel free to skip this attraction and head on over to the Iwaya Caves and Chigogafuchi Abyss. Nestled on the wesern end of Enoshima Island are the Iwaya Caves and the Chigogafuchi Abyss. Previous buddhist monk training ground in the Nara era, the Iwaya Caves consists of two natural caves-turned-shrines housing relics and statues from Enoshima’s past. While the caves are not much to write home about, the walkway to the caves overlooks the Chicgogafuchi Abyss, boasting gorgeous coastal views of crashing waves alongside a breathtaking view of Mt. Fuji. Heads up, the area is subject to very strong winds so we highly suggest extra precaution when climbing up and down the boulders to avoid being blown away! Next up on the itinerary is Kamakura, oozing of traditional architecture with its many Buddhist temples and Shinto shrines. And what’s a visit to Kamakura without paying respects to the iconic Kamakura Daibutsu (Great Buddha)! A designated kokuhō 国宝 or National Treasure culture heritage site, this particular Daibutsu is vying for a spot on UNESCO’S list of World Heritage Sites, making it a must-see for culture-lovers. To get there from Enoshima Island, walk or hop on a bus to Enoshima Station, take the Enoden Line heading towards Kamakura to Hase Station, and follow the signs for Kōtoku-in. Price: 200 yen entry and an additional 20 yen to get inside the Daibutsu. Beginning from the round-about outside of Kamakura Station, and leading right up to the Tsurugaoka Hachimangū is the Komachidori Street. Legend has it that it began as an outdoor market held in front of the shrine. Today, more than 250 restaurants, cafes, and boutiques selling traditional gifts and sweets line the bustling street. It’s the perfect place to do a spot of souvenir shopping enroute to our final destination at the Hachimangū! The most proninent of Kamakura’s Shinto shrines, the Tsurugaoka Hachimangū is located both geographical and culturally in the city center. After defeating rival Taira clan in 1180, Kamakura Shogunate founder Yoritomo Minamoto established Kamakura as the nation’s defacto capital and built the shrine as a tribute the Hachiman (八幡神), Japanese god of war and archery. Today, the shrine houses two ponds representing rival clans Minamoto and Taira (Tiny Trivia: the Taira pond has four islands, as “four” holds the same pronunciation as “death” in Japanese), a peony garden, and a small museum. It’s also among the nation’s most popular shrines for hatsumode (初詣), with record breaking visitor numbers of over two million! Not up for a day trip or a lengthy train ride? Check out our Ultimate Nakano Guide for a low key yet fun-filled afternoon right in the heart of suburban Tokyo! Akemashite Omedetou – A Kyushu New Year! In Japan, New Years is not about popping champagnes, midnight kisses, ball drops, and a foggy memory of the previous night. Instead, it is a relaxing time for families and friends to visit shrines, enjoy watching New Years TV specials, and huddle under the kotatsu. Cultural Tip: If a member of someone’s family has passed away, traditionally, it is not appropriate to send them a New Years card or say “Akeashite Omodetou” as the family is mourning. This year, our staff spent Japan’s most important holiday in Fukuoka, Kyushu! It was no ordinary New Years, but one spent helping out in a Buddhist temple. On New Year’s Eve, people eat 年越しそば (Toshikoshi soba), meaning “year-crossing buckwheat noodles” that represent hope for a long-lasting life. It is usually served at temples, where many people come to line up and ring a large bell, rung a total of 108 times. The number 108 represents the worldy sins and it is believed that ringing the bell will rid those sins of the past year. As midnight approached and all were warmed up and full with soba, countdown commenced and party poppers danced in the night sky. Most people will go to their local shrine to do “hatsumode,” the first visit of the year to the Shinto shrine. There, you will see locals praying, warming up around the bonfire, buying a fortune from the stand, and having some sweet sake or pork soup. Usually very late into the night and sometimes until dawn, families and friends are chatting and enjoying good company to kick off the New Year. New Years Day is a relaxing time spent with family eating osechi, the traditional New Years food assortment that symbolizes prosperity, luck, and happiness in the coming year. Ozoni is a mochi soup also enjoyed on New Years Day, but if you are at a temple, you’ll be lucky enough to help make it! Ozoni has different tastes depending on the region. Kyushu ozoni commonly features a white-miso base but this year’s was particularly special. One of the members of the family got married and it is a Kyushu custom for the husband to bring a large fish to his wife’s family for New Years. We enjoyed this year’s ozoni featuring yellowtail, it was delicious! It is not as common these days, but some families will drink otoso, a medicinal spiced sake, usually served by the youngest family member. Three cups of different sizes are stacked on top of one another as each member of the family takes turns and chooses their desired cup. The person serving will drink last and will have otoso served by a different member. After the cleanup and relaxing time over snacks and drink with family, we visited Fukuoka’s most famous shrine, Miyajidake Jinja. Be prepared to see a long wait and large crowds at the shrine on the first few days of the new year of the people who are there to do “omairi,”the act of praying at a shrine. Some larger shrines hold a 3-4 day festival with food stands, performances, and handcrafted goods for families, friends, and couples to enjoy. Before going back home to Tokyo, we couldn’t leave Fukuoka without eating the famous tonkotsu ramen! It was a perfect end to the beginning of the year. Follow us for more tips, trips, and living accomodations below! Sangubashi is a charming, hidden suburb nestled between the tourist hotspots of Shinjuku, Harajuku and Shibuya. Its great location has lead it to become a popular residential area with Japanese and non-Japanese alike. Judging by the flash cars crawling down the busy shopping street and tiny dogs in designer wear, you can guess that the local inhabitants are pretty well off. If you’re looking for a place to live or just a short term visit, Sangubashi has overflowing appeal. These are our top picks for things to see, do and, most importantly, eat. The charms of living in Sangubashi are obvious from one quick look at the map. The giant, green blob that has gobbled up the whole area from Yoyogi to Shibuya is Yoyogi Park. Massively famous, this grassy sprawl offers a place for Tokyoites to just chill, while watching sparkling fountains in the summer sun. At the weekend you can be entertained by the street performers lining the path. Fashion hub Harajuku can be reached by a pleasant walk to the other side of the park. Although it is not Japan’s most eminent shrine, Meiji Jingu is arguably the most famous one, with most tourists at least making the effort to pop in. Coming in from the Harajuku entrance, visitors take the sudden plunge into a spiritual nature walk with towering trees blocking out any trace of the Youth-culture capital outside the shrine’s walls. Coming from Sangubashi you can take the little-known back entrance, avoiding the crowds… initially at least. If you’re feeling a bit run down, check out Kiyomasa’s Well, a ‘power spot’. Japanese people believe you can get a bit of extra energy from visiting such places. It’s worth a try right? If all this sightseeing works up an appetite, hop over the road from the Sangubashi exit of Yogogi Park. Park Arms is an American style restaurant that sells all manner of hamburgers as well as formidably sized sandwiches. Even better than the food is the fact that dogs are welcome to sit in with their owners, so there’s plenty of cute pups to fawn over while waiting for your meal to arrive. This restaurant seems to be always busy, the raucous laughter of merry-makers is audible from outside most evenings. If you’re in the mood for affordable slabs of okonomiyaki and monja-yaki with various toppings available you’re in luck, but we recommend you make a reservation in advance. Two words: cheese naan. This Nepalese restaurant offers inexpensive set meals at any time of the day, choose your curry from an extensive list and it comes with salad and your choice of rice or naan. For a few extra yen you can make your naan cheese or garlic, and we really advise you to do so. It’s not unusual to see unfortunate salary men who missed the last train home sleeping rough in an array of strange locations. Luckily, if you’re staying in Sangubashi you can party all night in Shinjuku, Harajuku or Shibuya and walk home. Or even jump in a taxi without breaking the bank. There’s all night arcades, karaoke, restaurants, the fun never ends. Shibuya has many 300 yen per drink establishments popular with locals as well as travellers. You can easily forget all about that last train, without ending up asleep on a park bench. Want to live in or visit Sangubashi? We have a share house there that also accepts short terms stays through AirBnB. If you have a dietary restriction, eating out in a foreign country can feel really unfair. You want to be able to try everything and eat like the locals do. Food is such a massive part of a country’s culture you can feel as though you’re missing out. Luckily for Muslim visitors and residents in Tokyo, you can sample plenty of ‘Washoku’ (traditional Japanese dishes) as well as Japan’s other famous dishes in restaurants that are completely Halal. Here’s a guide to must-try foods for Japanese cuisine beginners, complete with links to Muslim-friendly restaurants. Washoku is traditional Japanese cuisine, characterised by light dishes with subtle, refreshing flavours that are packed with seasonal ingredients and use rice as a base food. A typical comfort dish of soupy, noodly goodness. Japanese people eat it to regain their strength after a tiring night and now you can too! Honolu even serve sides of Halal gyoza which will definitely help you get your genki-ness back! Another noodle dish, soba is a bit like ramen’s healthier cousin, buckwheat noodles swimming in a light broth. It can also be eaten cold with a dipping sauce. Yoshitomoan offers Halal options for all your soba needs. A classic. If you like your fish uncooked and lying on top of a little vinegared rice bed, you are in for a treat. Like yakiniku, shabu shabu has the do-it-yourself fun factor. You swish the meat around in boiling broth until cooked. This restaurant is pretty expensive due to the meat being Wa-gyu (premium Japanese beef) so don’t go unless you’ve got those yens to spare. Bento are a staple of Japanese culture. People take great care making bento (lunch boxes) for their partners and children, to show love and get them through the work/school day. This website delivers bento to your door, what’s more caring and heart-felt than that? This is of course, not an exhaustive list. Please give your own recommendations in the comments! Nerima has a reputation for being a bit relaxed (read boring), but there’s actually plenty of little-known attractions for an easy-going day out around Nerima station. If you’re looking for somewhere to live, this convenient and cheap residential area is perfect for commuting to areas such as Ikebukuro, Shinjuku or Roppongi. Walking through the unassuming suburbs there’s no way that you would guess there’s a theme park awaiting you around the corner. True, it’s not exactly Fuji Q Highland, but there’s charm in this old amusement park yet. The wooden merry-go-round of Toshimaen theme park is a designated important cultural property. But thrill-seekers never fear. Once July rolls around the water park is open, with plenty of scary water slides to get that adrenaline rush, and a beautiful night pool where you can float under the summer stars. Nature lovers will also be happy to know that surrounding the amusement park are beautiful gardens designed by the famous Japanese landscape architect, Kenzo Kosugi. They were designed specifically so that every season would give a different look. The best way to enjoy these gardens, is a dip in the Niwa no Yu onsen (public bath) next door. The outdoor baths give a gorgeous view. There are even co-ed saunas where you can hang out with your partner or guy friends (in bathing suits of course!). Get ready die-hard mountain fans, because Nerima City Hall offers a view of Mount Fuji for free. But definitely check the forecast before going as it can only be seen on clear days. You can also catch a movie at the United Cinemas cinema complex by Toshimaen station. Wednesday is ladies day meaning you can see all the latest flicks for a very affordable 1100 yen. Pig Plus is one of the best restaurants in Nerima for sure. Nerima was a farming area back in the Edo period and nowadays there’s still plenty of farms on the outskirts. This restaurant uses only Nerima produce for its celebrated dishes. They even do take-out if you feel like taking a full rotisserie chicken home. No judgement here.